When the first sight of Spring hits and the sun is out over Humboldt County people can’t wait to have an outdoor adventure. Two of our Gyppo Ale Mill employees set forth to kayak down the Eel river. The Eel River is Californias third largest watershed! It is protected from dams by State (1971) and Federal (1982) agencies because of it’s Wild and Scenic River designation. With three forks in the Eel, it contains several river types - high mountain pine forests, flowing through steep canyons and coastal redwood forests that empt into the Pacific. The two adventurous women started their journey at Toobey Park and let out in Phillipsville near the entrance to the Avenue of the Giants. This time of year, the water is high and swift so it’s not a trip for the inexperienced paddler but the perfect time to capitalize on an early Spring day. With water rushing and moving at a good pace the girls steered the kayak around the trees and bushes in the middle of the river all while looking at the beauty of the Redwood Forest. They passed fly fishermen and other boat cruisers seizing this beautiful day in Humboldt County. They made sure their packs were stocked with water, snacks and our favorite Gyppo Ale Mill beer. The girls took a break at Redway Beach and cracked open a Blood Orange Wheat growler of craft beer. Continuing their journey they hit two set of rapids that threw them for a thrill and adrenaline rush. It was a moment they will never forget. Pulling up to Phillipsville the girls were stoked on their 3 hour kayak trip down the Eel River. This is a highly recommended adventure to see the Redwoods as you kayak down the river in Humboldt County. When people are driving the Avenue of the Giants with the majestic redwoods, they have no idea just how close they are to California’s Lost Coast. , the longest stretch of coastal wilderness in the continental United States. Fortunately for the Gyppo Ale Mill, we get to call this wonder filled and rugged area home. Getting to know the gems that are sprinkled around us is one of the joys of living here. Little Black Sands Beach is just one of those unique and beautiful places that make Shelter Cove unique among the array of small California beach towns. Tucked away and honestly a little hard to find is the shy and secluded little sister to Black Sands Beach, aptly named, Little Black Sands. 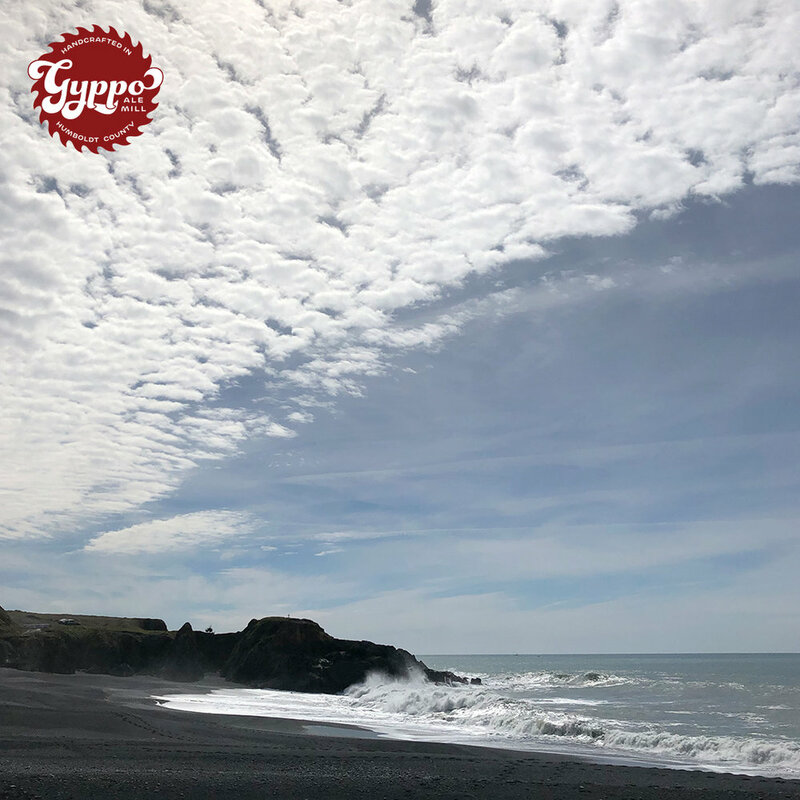 Little Black Sands Beach is the perfect cozy spot to throw down your beach blanket, unlatch the picnic basket and of course pop open a growler of some Gyppo brew! Delgada Canyon is located in front of you, where the ocean floor plummets 450 feet deep just ½ mile off the shore. This canyon creates a display of crashing waves that is a stunning water work show. Did we mention the whales? Delgada Canyon offers you rare opportunity to watch pods of whales frolicking and splashing at an incredible close distance. Top that Sea World! If this is the year you visit the California Redwood Coast, be it tackling one of California most beautiful foot races, the Avenue of the Giants Marathon or the historic motorcycle rally, The 42nd Redwood Run. 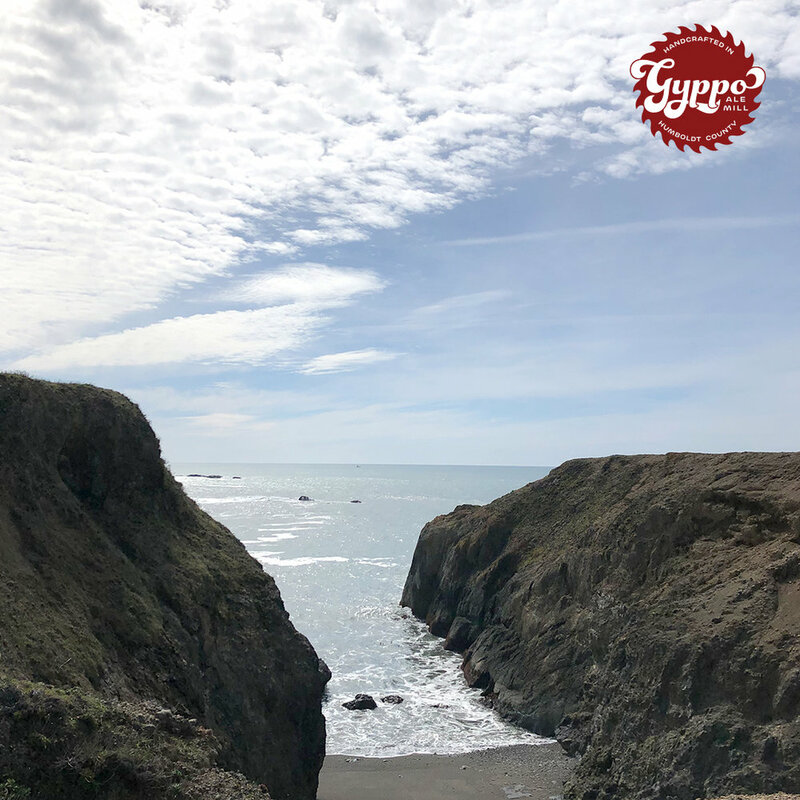 Make time to take the adventurous drive out the California’s Lost Coast where the mountains, (Kings Peak 4,088 ft) meet the sea in three short miles. While you are here don’t forget to stop by the brewery for some house made craft beer and Shelter Cove’s most delicious fish and chips and famous Gyppo Chokesetter Burger! We are located on the 9th hole of the Shelter Cove Golf Links, directly next store to the Shelter Cove Campground. If you are lucky enough to own your own small airplane (or know someone who does! ), fly on in and take the 5-minute walk to come for a visit. We promise you; you will not regret it. Our Boots to Beer Blog is put out weekly. Please check back for a new gem each week/month. We love seeing you out enjoying this place we call home. Please tag @gyppoalemill in your social media post! Cheers to the Freewheeling life! 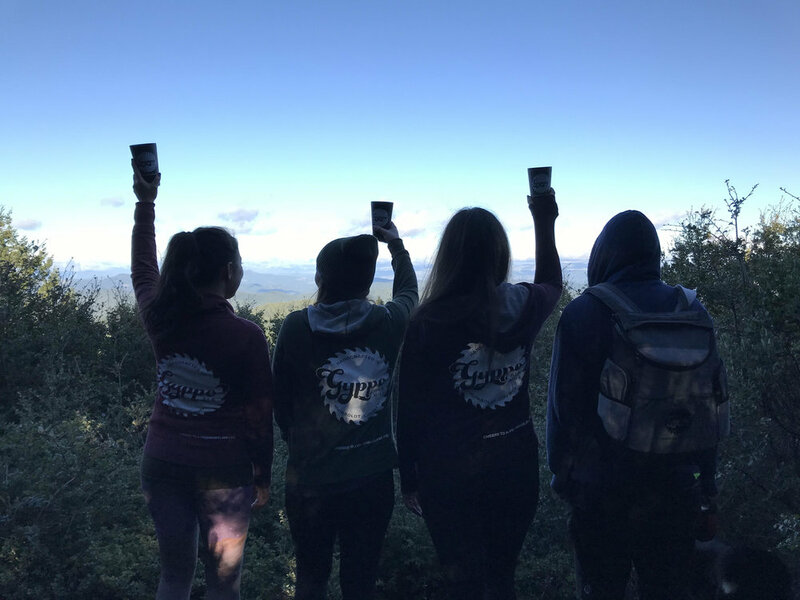 In search of an epic view to enjoy a cold craft beer? These adventure seekers find themselves in one of the most remote and beautiful coastlines, California's Lost Coast, in the King Range National Conservation Area. We come prepared sporting our Gyppo Ale Mill insulated backpack loaded with the essential, snacks, sustainable stainless steel cups, glass growlers of Blood Orange Wheat Beer & and even a jug of Belgium Dubbel. 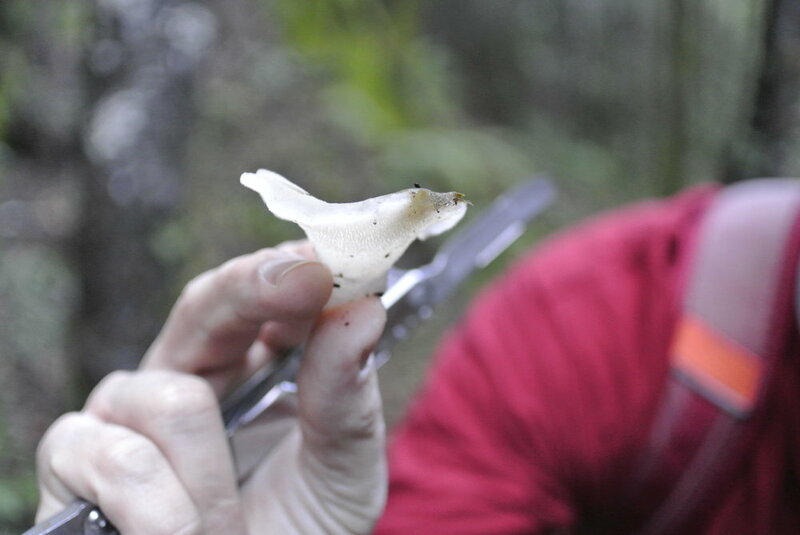 Our journey begins in a deeply forested Wailaki Campground named after the indigenous people of the area. Sounds of trickling creeks greet us as we cross a handsome wooden bridge and meander among sword ferns along a single track trail assent. It’s a beautiful climb to the top through the depths of the forest - the mushrooms in the winter and wildflowers in the summer allow for entertainment year round. Look closely and you can identify a rare mushroom or two! Stream crossing with with mossy rocks make for picturesque spots for a quick water break and the opportunity to snap a photo to document this amazing adventure. Upon reaching the peak of the mountain we are met with a breathtaking view. Blue skies with puffy white clouds and miles and miles of wilderness. We bust out the snacks and open our growlers of beer. It is these shared moments among friends admiring the beauty of Southern Humboldt and all mother earth has to offer that make Boots to Beer memories that much more monumental. Gyppo Ale Mill embracing the freewheeling and sustainable lifestyle all while enjoying a cold craft brew. 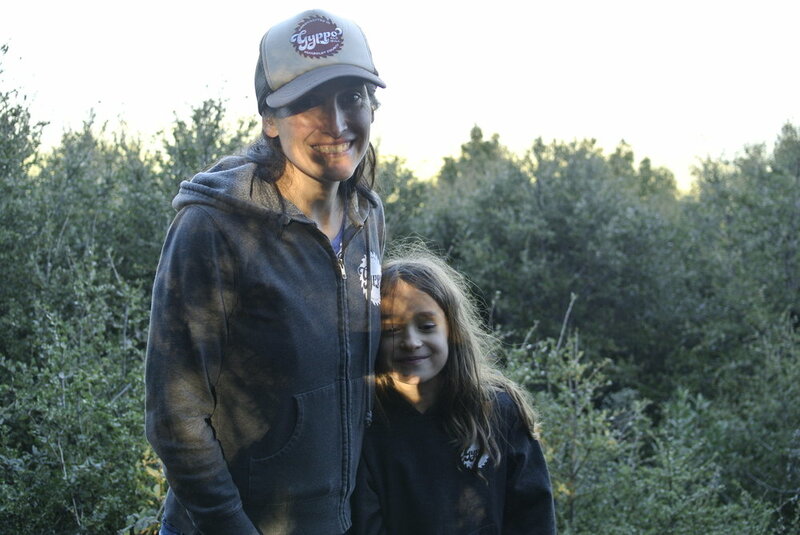 We would love to see photos from your Chemise Mountain trail hike. Share them here. Cheers! 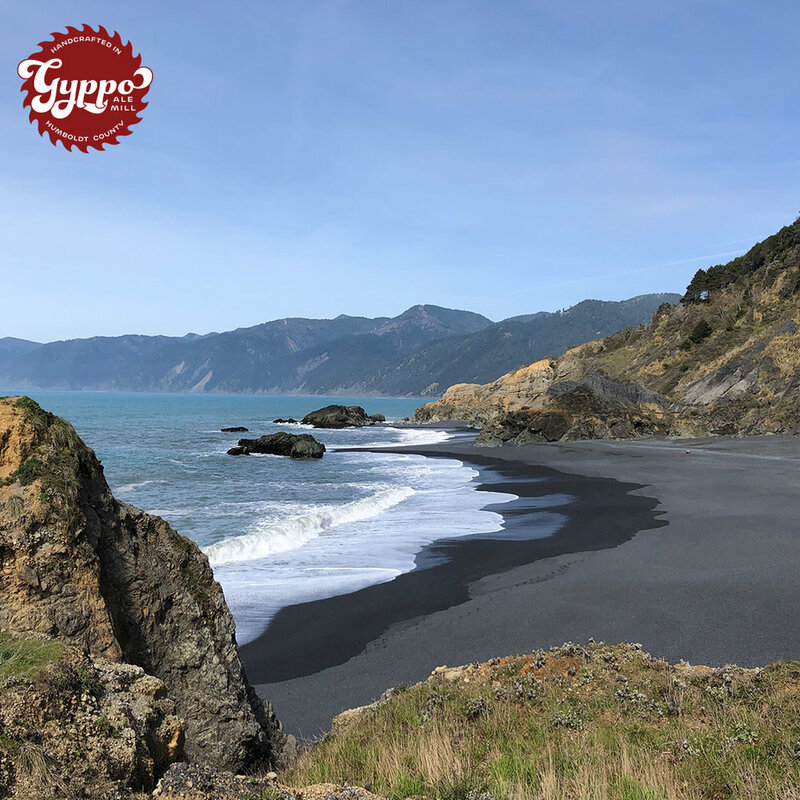 Secluded on the shore of the Redwood Forest in Humboldt County, CA you will find a gem of a brewery full of award winning beers - Gyppo Ale Mill. Shelter Cove is home to the only brewery in Southern Humboldt and one of only three restaurants in a 20 mile radius of country roads that take twice as long to drive. It is the most natural and undeveloped area of California coastline today. The gorgeous road through Kings Range Conservation Area to Gyppo Ale Mill is only half of the adventure. But, you can count on us to be waiting your arrival with a pint of cold beer! Become lost in Shelter Cove with Gyppo’s mouth watering gastropub food and taste flights of beers all brewed in-house. Off you’ll go to explore the scenery with a growler of our local’s favorite, Mexican Logger or West Coast IPA, we’ll send you out to explore Shelter Cove’s Black Sand Beach, hiking the famous Lost Coast Trail, and charter fishing the Pacific Lost Coast where the salmon run. The outdoor activities are endless in beautiful southern Humboldt. Travel to the most remote brewery on the Lost Coast of California a scenic adventure you will never forget. Now we know what your thinking - Lost Coast, missing persons, Netflix’s Murder Mountain. Don’t let Hollywood scare you away from the experience of sitting back at where the Redwood Forest meets the Pacific Ocean and enjoy the company of a small town with a big heart. The name Gyppo stands strong as a term for an independent logger and later translated to an independent lifestyle of the Humboldt hills. Travel to the last sleepy beach town on California’s Redwood Coast. If your passing through on a road trip or live in Northern California we invite you to take the day trip out to California's most remote brewery. Mention this blog post and we will have something special waiting for you at the end of the majestic Shelter Cove road!